Programs attached to laws like the PATRIOT Act, the Real ID Act, and the Western Hemisphere Travel Initiative all contain language which expands the government's powers to demand identity and to track or limit your movement based on “official federal purposes”. The PASS ID Act limits the scope of Real ID's current determination of federal purpose, but leaves the door wide open for data surveillance through opt-in State based fusion center hubs. Ordinarily, you have a right to demand accountability for actions which required your consent and finances to search you in these circumstances. Increased demand for identity comes down to demand of a type of " ID currency" in advance of any potential challenge or threat you may pose from entering federal buildings, banks, and airports where you paid to travel in advance. Challenging the requirements for identity when approached by local and federal authorities gets tricky. For example, I will call a random demand of identity by an authority figure an identity toll. An example of an identity toll is showing your ID to TSA at the airport in order to fly. If you want to exercise right to refuse or challenge a random identity toll by local or federal authorities, the very least you must do is qualify the request for identity currency. For instance, ask them to self-identify. Write down what type of identity they asked for, get the first and last name of the administrator and/or a badge number. Then the exchange is even and a toll would balance. The frequency of identity tolls will continue to escalate as long as the legal precedents are tolerated by citizens. 24 state governments recently refused the hefty demands on identity in the Real ID Act. These States punted the regulations along with the expensive price tag back to Washington for repeal or at the very least reconsideration. The Real ID Act to some is a paper zombie, appropriated for in name only and dormant until U.S. immigration policy is dealt with. However, it remains law. It even recently received $60 million in a DHS appropriations bill. An amount which did not differ from 2008's disbursments for national identity developments. I venture a guess that Legislators behind the PASS ID Act are gambling on States who will file extensions to in order to give a relief quote to identity vendors waiting in the lobby. Since 36 State's kicked the extension process to the curb it doesn't look very good for vendor projections. This is proof citizens realized they reserve the right to deny the unqualified surrender of their identity capital to national security or governed agendas. It is always up to us determine the demand on something as personal as identity. US citizens stand to lose a great deal more than mere convenience over the matter of national identity cards. A question to clarify: what happens if a fingerprint does not establish my citizenship? Or my birth certificate? Or any other piece of documentation I present to work or attain goods and services? I lose my recognized rights as a U.S. citizen. People without legitimate US citizenship live in fear of losing their established lives and livelihoods in the event of a federal raid. One could be detained, assets seized for prolonged periods with or without counsel. If a citizen has no control over the documents which interpret their citizenship and their rights at birth, they may lose everything. Conspicuous public private corporate lobbys tend to put marketing ahead of interpretations of citizenship or privacy. The laws are present to support the market for their technologies or gadgets. This is one contributing reason why repealing legislations, like Real ID, would get $60 million in taxpayer finance. Government contractors have the corner to capitalize on our free and established identity as long as the law will support it. Vendor profit is a poor excuse to allow bad law to continue. Grassroots abolition coalitions are always forming. Discussions about how to do away with bad laws are ongoing in Washington. There is an unnatural attachment to law in Washington, even treacherous, deeply flawed laws like the Real ID Act. One question being tossed around by analysts and thinkers in Washington is what will replace a repealed law like Real ID once it is gone? You might get the picture of panicky politicians fretting about the absence of a rotten tooth in the mouth of a massive bureaucratic beast, which breaks teeth, loses teeth and grows new teeth all the time. A repeal would not simply kill Real ID, it would kill the corporate entitlement check going to an biometrics or ID card vendor. The difference it makes is in the bottom line of those most impacted by the removal of corporate welfare finance. Washington can simply make new laws tomorrow. That is what they do in Washington - make laws. The biggest difference here should be in who they make the laws for: individual citizens or public-private interests competing for the taxpayer dollar. In a letter to congressional leadership on Wednesday, the National Governors Association disclosed that as many as 36 states won't meet the end-of-year deadline. Another 13 states have thumbed their noses at the federal government by passing laws that prohibit participation in Real ID, which states have long viewed as an unfunded federal mandate that could violate their residents' privacy. The recession, meanwhile, has ravaged state budgets and is likely to further erode states' willingness, or their ability, to comply with Real ID. BTC - Why comply with a federal program which is fit for repeal? It's a waste of paper. Governors and state leaders have more important stuff to do. While many NGA governor's seem to be "okay" with PASS ID; their state constituents need to recognize that the new legislation still relies on the majority of Real ID to stay in place and to eventually procure state funding for centralizing identity databases. One of the original critics of Real ID, Governor Sanford of South Carolina, openly opposed the build of centralized databases as a continued risk to privacy in the PASS ID Act. of the Real ID Act and the PASS ID Act. 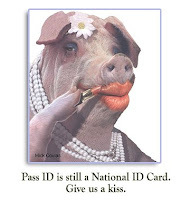 WASHINGTON -- While Congress debates national health care legislation that could put new fiscal burdens on the states, the nation's governors are pushing Capitol Hill for a reprieve from another costly federal program that states have long criticized: Real ID. The program, created in the aftermath of the 2001 terrorist attacks, requires all states to start issuing more secure driver's licenses by the end of this year. Residents of states that do not comply with the deadline will not be able to board commercial aircraft or enter federal buildings using their driver's licenses beginning in January. In their letter, the governors urged Congress to approve a replacement version of Real ID -known as Pass ID - that would give states more time and flexibility to upgrade their driver's licenses, including the processes used to check applicants' identities. BTC - Those watching for Real ID news are going to see an uptick in the amount of State and national coverage of the PASS ID Act, immigration and Real ID. Hang on to your hats - this is going to get very political. In 2007, Maine was the first state in the nation to reject the federal real id act. The legislature voted in favor of a resolution to refuse the law, which was passed in 2005 by congress. Today, Maine is complying with the federal law, but at what expense to mainers? Tonight, we continue our report on: Maine, the way life should be - but has government gone too far? TV5's Central Maine bureau chief Adrienne Bennett joins us now with more on that. Real i-d is a matter of national security - that's the federal government's view. But, can government successfully protect everyone? "It is impossible for the government to ensure that everyone is who they say they are." As executive director of the Maine Civil Liberties Union, Shenna Bellows believes equal protection and privacy, are fundamentals which ensure freedom for everyone. Bellows says the feds stepped over a line to set an example, unfairly targeting Mainers when state officials said they would not comply with real id. Shenna Bellows: "Unfortunately, I think that the real id debate has been characterized by a lot of politics. Maine was the first state to opt out because of the privacy and cost concerns and then the federal government under the Bush administration punished Maine by saying if you don't implement these real id requirements, you won't be able to get on planes. Why Hawaii wasn't subject to the same requirements than the state of Maine is really beyond me. It's something that I don't understand." Responding to the single most devastating act of terrorism on U.S. soil, the September 11 attacks prompted Congress to pass measures that many argue aren't working. Real id was created with the intention to protect Americans. However, Maine Secretary of State Matthew Dunlap encouraged state legislators to pass the law which allowed Maine to refuse to take part. Adrienne Bennett: "Can government, in your opinion successfully protect everyone? Matt Dunlap: "No, absolutely not. I think we're fools to say that we can." Matt Dunlap: "You can't take non-secure documents like birth certificates, which are public record. If you know the person's name, you can go down to vital records and get a certified copy of their birth certificates. Social security numbers aren't terribly secure. When you take all these non-secure elements and you put them together, you're not necessarily building a secure document. " Adrienne Bennett: "So identity doesn't equal security?" Matt Dunlap: "No, not at all. In fact, one of the arguments has been to the contrary. When you put all this information in one place, you make it easier for identity thieves and terrorists." Today, Maine along with every other state, is dealing with shifting deadlines and undefined requirements to be in full compliance with real id, a law that's been in play for four years. There's new legislation on the table in Washington to convert real id to pass id before the years end. Matt Dunlap: "It's not real clear how much different this is going to be from real id. With all these changes swirling around, it's very difficult for anybody to keep on top of what the latest developments are." Pass id is short for - providing for additional security in states' identification". Over the summer department of homeland security secretary janet Napolitano met with U.S. governors calling on congress to act quickly to pass the legislation, citing the bill's privacy protection provisions, reduced costs and greater flexibility for states, all of which they say would enable standards to be implemented a year ahead of current real id deadline of 2017. NOT SO F.A.S.T. , DHS!!! Several Republican lawmakers are worried about the privacy issues of a screening technology being developed by the government that combines a video game balancing device with thermal, ocular, respiratory, and cardiac monitors. The technology is being developed by the Homeland Security department (DHS) and if approved could be used to spot potentially threatening people at airports, sports games, and border crossing areas. In October through our excellent...group meeting discussions I expanded the possible smart grid privacy concerns list to 15. See my updated PDF, “Smart Grid Privacy Concerns: October 2009". Over the next few months, contractors will finish building a 15-foot-high steel mesh fence along the spine of the new berm and another, smaller earthen bridge across Goat Canyon, just to the west. Dirt roads will run along either side, and in most places, the primary barrier will be reinforced with a 10-foot-high chain-link fence on the north side. The new fencing joins a decades-old corrugated metal vehicle barrier a few hundred yards to the south; together, the three fences will create a three-tiered barrier between the United States and Mexico. to simply being "in deep trouble"
A major concern is the requirement to link all state driver's license databases via a central hub for data sharing. 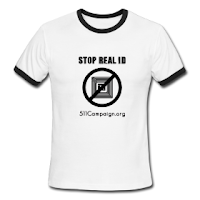 States, too, have railed against Real ID as an unfunded federal mandate, and most have refused to participate. DHS Secretary Janet Napolitano was one of the first state officials to reject Real ID when she was the governor of Arizona -- and that makes it hard for her to push it on other states now. "For all intents and purposes, Real ID has been put on the back burner," said Pam Dixon, executive director of the World Privacy Forum. "But it isn't dead yet." BTC - Downsize DC made tremendous gains for campaign acceptance by expanding their intent to repeal Real ID in Pennsylvania. well as commentary and context from national copyright experts. NEW DELHI -- The tech chieftain leading India's effort to issue biometric national ID cards to its 1.2 billion people says the first challenge he faces isn't technological -- it's political. Nandan Nilekani stepped down as co-chairman of outsourcing giant Infosys Ltd. in June to take over the massive government project, collecting information on its citizens and helping India's poor get access to services that require proof of identity, from government wheat rations to mobile-phone subscriptions. The initiative requires basic personal details and biometric data such as fingerprints to be collected from every corner of the country and safeguarded from hackers.